Required Reading -- After way too much trashy summer reading, I needed a good dose of thoughtfulness. I found it in my blog pal Sarah Irani's amazing list of 15 books that will change your life. 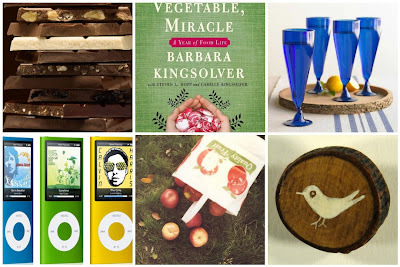 I'm only halfway through the list, but I was particularly touched by a book I should have read years ago: Animal, Vegetable, Miracle: A Year of Food Life by Barbara Kingsolver. Birds -- I really do have a thing for birds. I blog about them all the time, whether it's the birds-in-decor trend or the real things. My staff love to tease me about this bird obsession, but what can I say...I just love them! One of my favorite things is the incredible Planet Earth series by the Discovery Channel that came out last year. I have just about forced everyone I know to buy it or rent it. It is really worth the investment for hours and hours of stunning imagery and captivating vignettes that aren't dry and stuffy (or gruesome) like most nature shows. I admit, the segment on tropical birds (and their hilarious mating rituals) was my favorite. Organic Chocolate -- My boyfriend knows I could not go a day without really rich, dark chocolate. I will even part ways with my morning cup of coffee before turning away from the sweeter bean. Just like coffee, though, it's important to choose fair trade chocolate so that workers and the environment are protected. (I also recently learned that many songbirds are in danger of extinction because of conventional coffee and chocolate growing systems, so that made me even more determined to stick to organic.) I really love Green & Black's. Dancing like nobody's watching. Maybe this is a little bit cheesy, but with our culture's emphasis on things and projects and accomplishments, I like to remind myself to indulge in childlike, even immature joys. I'm a pretty reserved gal in person, so "busting a move" in my living room to some really cheesy 80s music - what would we do without Bonnie Raitt? - and not caring if the neighbors see is a good way for me to lighten up and be a kid again when I start getting a little too Type A. Dancing is something that is free, fun and (obviously) eco-friendly. Cobalt Blue Glass -- It's really important to look for recycled glass, because glass's environmental impact (in terms of piling up in the landfill) is just as bad as plastic. But for a long time recycled glass was kind of, well, ugly. It was chunky and greenish and thick and knobby. Cobalt blue is my favorite color for glass - my grandmother collected it throughout her life and it always inspired me as a little girl. I was thrilled to see that green retailer VivaTerra has come out with some recycled glass in the form of gorgeous cobalt parfait glasses. Finally, pretty recycled glasses! Books, Birds, Nature, Décor -- The only thing missing in an eco-gal's life is a little bit of green tech. I think most of us bloggers are fairly geeky, even if we are primarily fascinated by stylish design and living. I said no to the iPhone but I couldn't resist the new, greener iPod nano. Just look at that wash of colors - they are almost edible! So great.....I particularly love her number 4 and too true....the Planet Earth series is jaw droppingly gorgeous and inspiring.